Ellen Woods edits romance novels, often getting lost in their pages, but her own life hasn't exactly been 'happily ever after'. After fifteen years of marriage, her husband's death left her devastated and a year later, raising her pre-teen son, Ellen learns she's about to loose their family home due to a mountain of debt her he left behind. Following her sister's unwelcome advice, she decides to rent out rooms and finds her home taken over by a two women, and one very handsome gentleman. Allowing strangers into her marital home turns Ellen's life upside down and she's forced to peer out from behind the romance novels she covets. Will she get her happy ending after all? 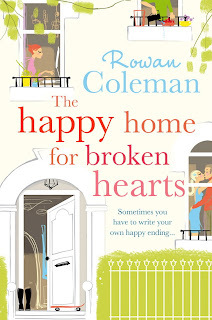 The Happy Home for Broken Hearts was my first Rowan Coleman novel and it did not disappoint. A great chick lit read, this novel is funny, yet has heavier moments as well as a cast of great characters and a unique premise that makes it stand out. The overall tone wasn't too depressing even with the story tackling the topic of grief, but that was probably helped because we meet Ellen a year later. Watching her stumble as she rediscovered life had me cringing at times, but others laughing out loud and I cared enough for her character to root for her to figure her life out. And I wasn't just cheering for her, but for all the other characters too. Each had complex issues that felt realistic and I loved them all. This novel had a unique thread that I hadn't read before in any form of chick lit as well as a few surprises which I loved. I also found that although certain things were shown to the reader before Ellen figured them out herself, it didn't come over as entirely predictable which I find can sometimes be the case when this is done. Not being a fan of romance novels myself, my attention was diverted whenever the story paused as we entered the fictional world of Ellen's romance novels. These departures were infrequent, but still jolted me out of the story, and I probably could have done without them. But that just might be me. I can see why Rowan Coleman fans love her novels so much. The Happy Home for Broken Hearts has a lot of heart, fantastic characters to root for, some unique plot threads and isn't entirely predictable. I'd definitely read another! I enjoyed The Happy Home for Broken Hearts from the very beginning as there was something very relaxed about the writing style. By relaxed I probably mean that it was easy to read and the voice was someone I found I could relate to right away so I didn’t have to struggle trying to get into her head. Always a welcome start! Coleman has written so that every single one of the characters is well established and realistic. She has also interwoven them into each other’s lives completely (which I suppose may not be entirely realistic as how many renters all end up eating in the kitchen together every night? But it worked for me!). I particularly liked the elderly author of romantic fiction, Allegra, she was such a large influence on Ellie’s emergence from her reclusiveness and encouraged her to find herself through confidence in her imagination and the ability to provide for herself. Another particular favourite for me was Ellie’s son and I felt that Coleman gave him a voice that wavered between child and young man which tugged at my heart. What impressed me most about this novel was that I was taken completely by surprise a couple of times by either the plot twists or things that were brought out from the past and having read many novels with the same easy tone I wasn’t expecting to be so turned upside down by some of the events. It kept me up reading much later some nights than was probably a good idea! I know that other reviewers say they weren’t surprised by the twists and there were one or two that were predictable but I maintain my stand that I was still surprised at least once!